European students relish the thought of finding work with big brand-name companies like Google, Microsoft and L'Oreal after they graduate, according to a survey of business and engineering students. For the third year in a row, Google (GOOG) is the most attractive employer among European business students, the Universum study found, while engineering and IT students most want to work at the German conglomerate Siemens (SI). Universum, an employer branding research and consulting firm, conducts annual surveys to determine which employers are most appealing to university students. This year's poll found that European business students value employers that offer ample professional development opportunities and a dynamic work environment, said Claudia Tattanelli, global director for Universum. Google came out on top among business students because it's seen as a highly creative workplace where employees can have fun, said Tattanelli. 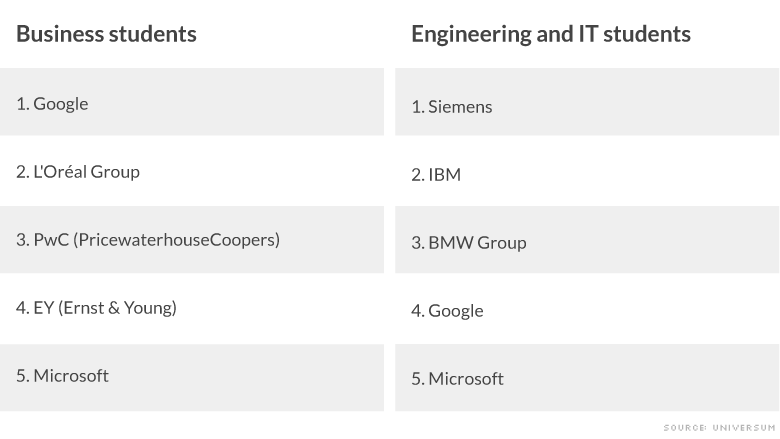 Google also placed in the top 5 among European engineering and IT students. Meanwhile, L'Oreal (LRLCY), which owns big beauty brands including The Body Shop and Kiehl's, scores high with business students because it's known for having a creative working culture and a robust internship program. Engineering and IT students also valued training opportunities and innovation. And they especially seek employers that offer challenging work environments. Siemens is "a true favorite" for these budding engineers because of its reputation for being at the "forefront of innovation and technology," said Tattanelli. "There are many global and diversified job opportunities from energy to health care." Like Google, Microsoft (MSFT) ranked high among both business and engineering students, and not just because of its techie cred. "Microsoft highlights the importance of employees making a difference and really promotes its corporate social responsibility initiatives on social media and other digital channels," said Tattanelli. The 2014 rankings were based on a survey of more than 135,000 business, engineering and IT students -- most of them approaching graduation -- across 12 European nations, including Germany, France, Italy and the U.K.